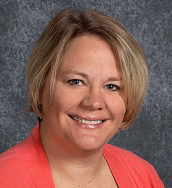 Jess Burger was named Iowa’s 2016 Elementary Principal of the Year. An energetic and active literacy committee has enhanced students’ excitement about reading at our school. One of the most engaging programs the committee has led is One School One Book. For the past five years, our literacy committee has selected a book that the school purchases for each family in our building to read together during several weeks in the winter (usually January and February). To help other schools who might be interested in doing something similar to promote family and school partnerships around reading, this blog describes how we have carried out our initiative. Choosing the right book can be tricky as we’re trying to connect to a large audience (grades kindergarten-4th), but we seem to have had good success with books such as The World According to Humphrey, Charlie and the Chocolate Factory, and most recently, A Snicker of Magic. These seem to offer something for readers of all ages and levels of experience. Because we provide copies of the book to each family, we have had to seek financial support. Our funding sources have varied from year to year and have included: local business donations, Scholastic book fair profits, and PTO contributions. The literacy committee holds a school-wide kickoff assembly to introduce the book to students. Staff members have dressed up as characters from the book, done challenge events, and shared excerpts with the students. Our goal is to get students excited about their upcoming reading adventure and send them off eager to share the book with their families. Motivating readers does not end with the initial assembly. We send home a calendar, indicating when each chapter will be read. Then, we follow each evening’s reading assignment with trivia questions announced on the school’s loudspeaker the next morning. Students compete to answer the questions. Daily winners at each grade level are drawn from the collection of correct answers, and those students’ names are announced so that the individuals can claim their small prize. Slightly larger prizes also are given out on a weekly basis. In addition, we provide students an extension activity related to the story each week and encourage them to complete the activity with the family members who are reading the book with them. These projects are displayed in the library throughout the One School One Book time period. The program concludes with a celebratory family night at the school. The literacy committee creates 8-10 activities related to the themes and characters of the book. Staff members and high school students volunteer to assist with these activities, which are held in various classrooms at our school. Students receive a ticket to be stamped as they complete each activity. After finishing all the experiences, their ticket goes into a drawing for a larger end-of-program prize. This year two students were awarded ice cream for a year (a gift certificate for each month of the year) donated by our local ice cream shop. One School One Book has created some excellent literacy opportunities for our students and families. As a school-family community, we are proud of the experiences we have fostered around a shared book and continue to look for other ways to grow an appreciation of reading and writing.